In the early hours of June 28, 300 military entered the Honduran Presidential Palace, disarmed the Presidential Guard and arrested President Manuel Zelaya. The President was quickly exiled to Costa Rica while the parliament swiftly appointed a puppet president, one of the richest men in the country. 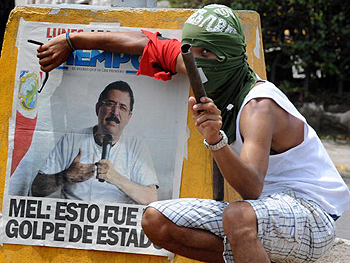 The first word from the deposed president was that this is a coup d'état not only against Honduras but the world. Only three years after winning the presidential poll in 2006, Manuel Zelaya has championed three major reforms in his country that earned him powerful enemies. The first was a land reform, necessary in a country where 7.000 people (around 0.1 percent of the population) own 80 percent of the land. With 50 percent of the population below the poverty line and more than 1.7 million people unemployed, the social problems in Honduras are critical. The land reform program was designed to increase small farms, encouraging the poor to engage in agriculture or alternative economic sectors. But landowners fought with ferocity to block this initiative. They also opposed President Zelaya's programs for building roads, sanitation and social houses in the poorest areas of the country, claiming these projects were economically unrealistic. Zelaya's second project was constitutional reform. Beyond the country's social and economical problems, the system had functioned under oligarchic rule for more than fifty years. The current constitution was forged under the watchful eye of the military dictatorship. To bolster the social and economic reforms he proposed, Zelaya also put forth a referendum that would extend presidential terms. When a poll suggested that the referendum would receive more than 70 percent backing, the Honduran elite quickly turned into a trans-party alliance in a plot to unseat the president. The third project that created enemies for the President was the moral project, a campaign destined to disclose high pay for officials and launch corruption inquiry into high state officials' fortunes. This measure cost the president the support of his own Liberal Party, made of influential characters with strong economic ties. The board of the party decided that Zelaya was a loose cannon and withdrew support for his projects. If this coup d'état works, it will serve as a threatening signal to Latin America that the old days of military dictatorship are back. Already there are frictions between the army and the heads of state in Ecuador, Bolivia and Argentina. Bolivian President Evo Morales just survived an attempt on his life mounted by the extreme right in his country, and a military plot in his country was uncovered in 2008. Venezuela's Hugo Chavez was a victim of a coup d'état attempt in April 2002, and Rafael Correa of Ecuador was also under threat of military intervention. If Honduras’ attempt proves to be a successful one, it could trigger a string of military intervention across Latin America, destabilizing the region. Already the European Union expressed strong support for President Zelaya. The Organization of American States stated recognition of Zelaya as the sole president of Honduras, as have several Latin American statesmen. The U.S. reaction was strangely equivocal, voicing concern only for constitutional rule. In light of this feeble response, questions have arisen as to how the Honduran military, a long-time U.S. ally, managed to mount a coup d'état without Washington’s knowledge or consent. Is it possible that leaders of the opposition with C.I.A. connections did not ask for C.I.A. support in ousting the president? A clear and severe condemnation of the coup leaders from the White House would help allay these concerns. Hugo Chavez announced in Managua, together with his counterparts in Nicaragua, Ecuador and Bolivia, that the coup in Honduras is a threat to the stability in Latin America. A threat to one country's sovereignty is a threat to the region, as no one wants to see the events of the 1980s repeated. Now the question is, will Latin America be strong and united enough to topple the military regime in Honduras? The future of the region hangs in the balance. Anton Caragea is professor of International Relations and Political Science, and director of the Institute for Research on International Relations and Political Science in Romania.